Joining “Operation Sagip Telethon” in this spirit of Filipino community are ABS-CBN Europe and Middle East Bureau Chief Danny Buenafe from the ABS-CBN Europe office at Earl’s Court Road; and hosts ABS-CBN TV and radio personalities top billed by Rose Eclarinal, and Jasmin Romero. ABS-CBN Europe correspondents will also deliver live reports from key points in U.K. Joining “Operation Sagip Telethon” in this spirit of Filipino community are ABS-CBN Europe and Middle East Bureau Chief Danny Buenafefrom the ABS-CBN Europe office at Earl’s Court Road; and hosts ABS-CBN TV and radio personalities top billed by Rose Eclarinal, and Jasmin Romero, plus artists Klarisse de Guzman, NovenBelleza, Jason Dyand DJ Jai Ho from the ABS-CBN headquarters in Quezon City. 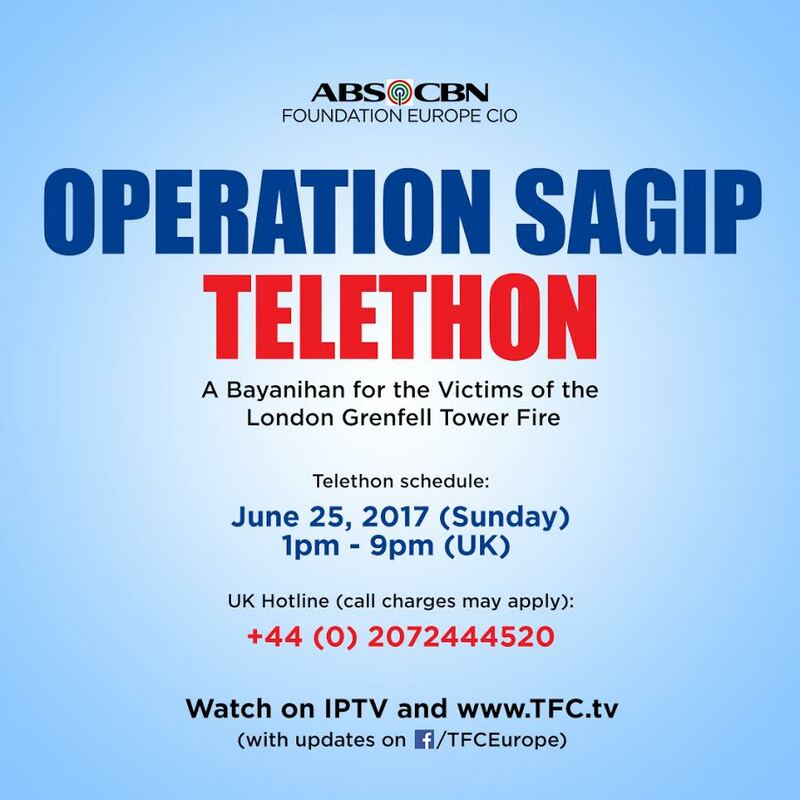 ABS-CBN Europe correspondents will also deliver live reports from key points in U.K.
“Operation Sagip Telethon: A Bayanihan For the Victims of the London Grenfell Tower Fire” is making the call for donations up to 9 p.m. London time. The telethon will be streamed via TFC online (www.TFC.tv) and TFC IPTV (in Europe), with live updates from facebook.com/TFCEurope. According to Luis Bariuan, Trustee of ABS-CBN Foundation Europe: “We are widely known for our unique culture and at its core is the quintessential Filipino trait ofbayanihanwhich inspires us to come together as one community with one goal in mind. We are rekindling that spirit of bayanihan by making a call for donations to support residents affected by the London Grenfell Tower fire”. However, Bariuan says the community spirit does not stop there. “In bringing life to bayanihan,we transcend barriers. As this tragedy faces us, we hope to bring the needed help toboth victims and survivors, including their families, with the support we may be able to inspire through the telethon”. To date, the United Kingdom Metropolitan Police reports death toll is at 79. Metropolitan Police commander Stuart Cundy says the death toll may still rise. • and Clarita CabidesGhavimiwho was saved by a Croatian who also lives in the same tower. The Philippine Embassy is pursuing search operations in rest centres and drop-off locations for donations, and hospitals to determine the total number of survivors and fatalities. The diplomatic post has requested for the official list of tenants of the tower from the Royal Borough of Kensington and Chelsea. While it has yet to ascertain the total number of Filipinos affected, Consul General SenenMangalile, in an interview with ABS-CBN.com,assures: “As always, the embassy is ready to give assistance to them”. These include assistance from the Department of Foreign Affairs in providing new passports and other vital documents. For more details about the “Operation Sagip Telethon: A Bayanihan For the Victims of the London Grenfell Tower Fire,” you can call +44 739 287 0779. (With additional reports from the Philippine Embassy in London, ABS-CBN Europe and Middle East Bureau Chief DannyBuenafe, and abs-cbn.com).